Total run time was 49 minutes. 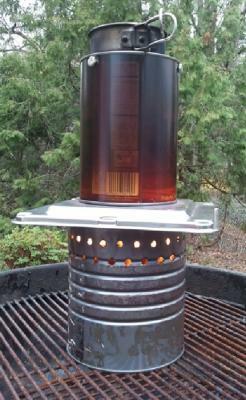 The first 2 minutes were allowed to burn with no load, ie an unobstructed stack. This burned off the alcohol starter. Boiled water for the next 42 minutes. Last 5 minutes were at the tail end of the energy curve and only warmed the water in the cup, but the water did not boil. With a bit more fuel I could have finished of another 350 ml of water. In a professionally designed stove, I would expect better numbers -- of course! But, for a simple educational tool costing nothing or very little, I am pretty happy with these results. Almost boiling. 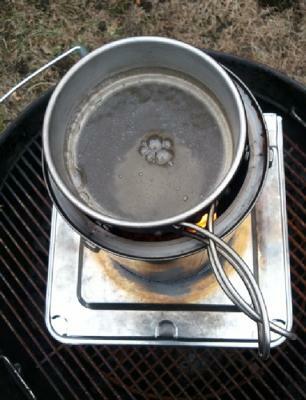 I timed each "boil" until a full rolling boil was achieved. I wonder how this tacks up against other test results?